Layering a huge watch with a pile of bracelets is one trend I've been seeing everyone doing this summer; and it's definitely not one you will want to miss out on. Don't have a stylish watch with a large face? Then definitely check out the watches for men that Orient offers! Why not the women's watches? They are just too dainty - you need one that will hold its own and not get lost under your eighteen other bangles, right? Simply be a follower of this blog and leave a comment on this post. 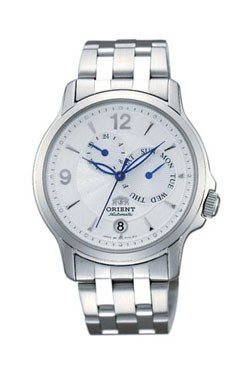 Be sure and visit Orient Watches and check out all their other great styles! Giveaway is open to everyone world wide and will run until Sunday, July 31st 2011 at 11:59 pm est. Ooooo I've been *dying* for a men's watch for a while now! I love this one! I need to buy a watch for my clinicals at the hospital! This would be perfect! Gorgeous watch, thank you for doing this giveaway. That watch is so cool! I like the dial that shows days of the week. I follow on google reader. Thanks for the giveaway! Ok, why not give it a try ! I love the watch and your blog!!! Awesome giveaway! I've been wanting a big watch for a while now! Love the watch, I'm following you! what a fun giveaway! i love a watch. i really like the metro sport one. the orange colored one is fabulous! oh i'm always wondering what day it is!! how clever they are!! I so glad I found this blog! Good taste and class is not so common. I love your tips, my daughter and I are also very feminine curvy woman. Awesome blog, great photos and I love love the watch give away. I would enjoy looking at it for a minute and than gifted it to my girl Jacqueline - I think I might borrow the beauty from her once on a while. Again can't wait for news. Oops, of course I am a folllower and tweet also. wow, what a great giveaway!! of course i already follow via GFC! What a great giveaway to come back to from holiday. :) And I actually don't own a watch. Unbelievable, huh? OOh what a fun watch! Love silver watches ... already follow you. I love the idea of wearing a men's watch--it would be a great contrast to an otherwise feminine look! btw, i read your interview on Shen Dove Style..i think i need to break some rules too.. i already broke the "no horizontal stripes rule".. no heels over 2 inches is gonna be quite the challenge! I am a follower of your blog and love reading about fashion. Would love the watch! Count me in! I'm a follower! i loooove this orient watch with the blue hands! what a great give-away! I just started following you after I saw a feature on you on Shen Dove's website. I've been looking for a statement watch and this definitely fits the bill! That's a cool watch. Following you on this blog and twitter. I'm a follower! I have been looking for a watch with a larger face. I am following you on twitter and I twitted about this giveaway. Love this. Want it. Give it. I would lOVE to win this awesome watch!